After 2 days summit in Arezzo, Matteo and myself came to the conclusion that the 2nd Segment of our trip around the world would take us from Ulaanbataar in Mongolia, where we completed our 1st Segment, to Tokyo Japan. We will be crossing Siberia heading towards Sakhalin Island and then south to Japan. It is now clear, that our trip around the world, will take us from Mongolia to North America all the way down to South America. Once in Buenos Aires (Argentina), we will ship our bikes to South Africa and attempt to ride the African continent northbound back to Italy, where this idea started and home for us. Bolivia has a surface area of 1,098,581 square kilometres, with a population of roughly 9 million people. More than half its population lives on less than one dollar a day. The child death rate is extremely high, because of malnutrition and of difficult health and hygienic conditions. Poverty and a scarce availability of resources to be assigned to the welfare state compel thousands of families to abandon their children. Child abandonment in this country has dramatic facets: every year, thousands of children are left in institutes: these are dilapidated and overcrowded structures, in which living conditions are only just above the threshold of survival. The “Virgen de Fatima” reception centre welcomes male and female children between 0 and 6 years of age. This institute is a temporary care centre, even though some children do remain there for over 6 years before being transferred to another structure. The centre employs a psychologist and two social workers. It also hosts a family clinic, managed by one doctor and six nurses. 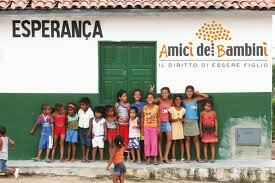 Ai.Bi.’s multidisciplinary team , together with the centre’s staff, checks the social and family status of the children, as well as their medical, psychological, educational and legal needs, providing food, water, health care and study support. Moreover, we check the children’s legal status, to facilitate the start of the necessary registration procedures in preparation for the issuing of identity documents. Ai.Bi. supports the institute also through the purchase of functional products and the organization of play activities for the children living in the institute.